Colors and patterns in German Shepherd Dogs have always allured the breed’s lovers. Sadly some colors and patterns are no longer existing in the German Shepherd Dog breed, as far as my knowledge goes. Blue is one of the rarest colors in the breed, while merle and brindle German Shepherd Dogs are almost out of existence. This post is about the brindle German Shepherds and is dedicated to those readers of my blog who really spare thoughts about colors and patterns in German Shepherd Dog breed. 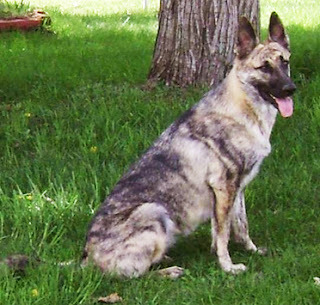 Irresponsible breeding program and negligence have thrown many patterns and colors into extinction; and brindle is just one of those extinct patterns in German Shepherd Dogs. I think it’s just because of the illogical decisions of some Kennel Clubs that many breeders and owners do not prefer keeping and breeding certain colors and patterns. I want to show my heart felt gratitude to those organizations that are working to prevent certain pigmentations and patterns from going extinct. Remember, there are NO problems related to health, genes, behavior and more specifically the working ability of the breed just because of its color. If a dog has a sound health and temperament and sound working ability, he is a good dogs, and Max Von Stephanitz – the breed founder said, “No good dog is a bad color.” So what ever color gene we have today, we need to deploy them to correct breeding program in order to prevent them from extinction like brindles and merles. These are all simply variations in color genes and do not affect the character of the dog. Brindle German Shepherd Dogs or Brindle Black Tan had been one of the founding patterns of the breed, and we have lost it, quite unfortunately. This particular gene actually affected the tan marked ground. This, in turn, made bi-colors and black tans show marble marks or dark stripes over the tan grounds, just like the brindle boxers. Candidly speaking, I have never seen a brindle dog, but I can guess who beautiful a brindle German Shepherd Dog would look like owing to the contemporary anatomical structure! We could develop the anatomy of the breed – beyond doubt! We have developed the structural aspects such as angulations and top line, but sadly lost certain genes like Brindle. Hopefully, if the brindle pattern re-appears, today’s German Shepherd breeders and owners will embrace it with love, and with a mission to protect it from further extinction. The brindle German Shepherd Dog was last surveyed in the year 1922, and unfortunately no GSD with brindle gene has been recorded in the books of any kennel club. Eye pigmentation has always remained un-related to that of coat. Brindle coats appeared in both dark and faded versions. Many dark brindle black tan German shepherd Dogs were in the possession of faded eye color, while some dogs that had brindle markings on faded tan grounds had rich eye pigmentation. This picture of the brindle Alsatian dog has been taken from the book on German Shepherd Dogs, authored by Brian H. Wootton. I would earnestly request my readers to help me out by providing more information about the brindle German Shepherd Dog. Also please provide me with pictures of brindle Alsatian dog, if someone has any. I promise to give you a credit for the picture in my blog. Many many thanks to Mary Mcintire from Michigan for sharing with us an excellent photo of her brindle GSD, named Rue.